People can collect the strangest things and what one person finds odd another finds fascinating. As a long time collector of vintage curiosities, I usually find myself gravitating to items of beauty or things that tell a historical story. Over the years I've accumulated a growing quantity of "oddities" and today I'd like to share one that is related to Dentistry and has an interesting story to tell. 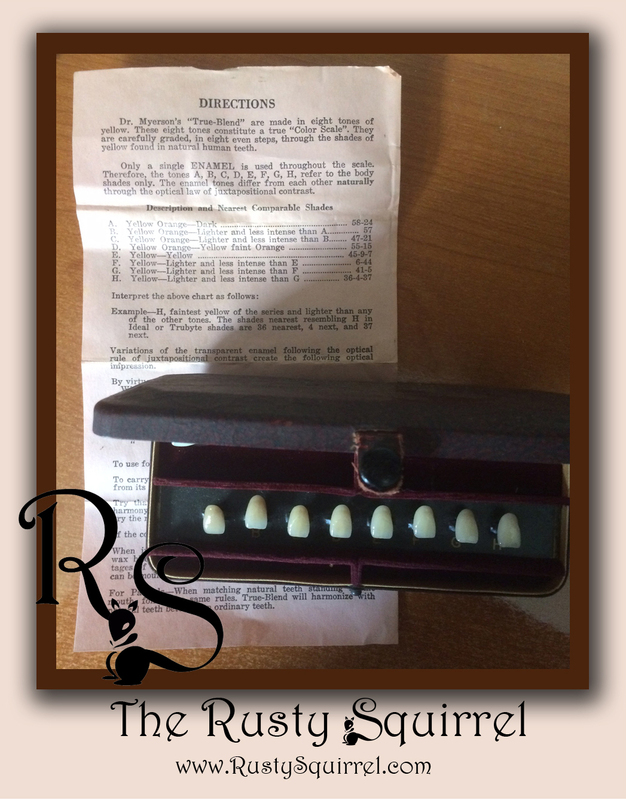 This is a vintage Dr. Myerson's "True-Blend" Color Scale kit by Ideal Tooth Incorporated and Made in the U.S.A. What's really so special about this set is that it appears complete with tooth colors from A-J. This box set also has the original instructions for use and the Dental Supply Co label is still in the lid of the case. There are a total of 10 slightly different colored teeth in the "True-Blend" system. Each tooth has a gold identifying letter on the back. There are labeled slots for A-H and then I & J are in the "Ideal" holders. The directions for using the system are printed on paper that has an interesting orange/coral color. The color of the paper appears much lighter in the photo than how it is in person. The paper is in very good shape and an unusual find, so a great addition to this set. Here is a photo showing the N.Y.C. Supply Co Label. Love the old phone number Wisconsin 7-7314, it makes me want to watch an old classic movie. A bit of History behind Dr. Myerson and "True-Blend"
In the early 1900s Dr. Simon Myerson was a practicing Dentist in Boston. He taught at the Harvard Dental School of Medicine and in his spare time worked on developing artificial teeth that had the appearance of natural. He founded the Myerson Tooth Corporation in 1917 and continued to make advancements of artificial teeth over his lifetime. Dr. Myerson was struck by an idea in 1935 that he and his eldest son Martin, who was a ceramist, worked on till the "True-Blend" artificial teeth were perfected. Dr. Myerson displayed his latest breakthrough to a room full of top-flight U.S. dentists at the Waldorf-Astoria Hotel in June 1940. Time Magazine wrote an article about Dr. Myerson and his latest advancement a week later, in the June 10, 1940 issue, titled Medicine: Unspottable Teeth. What made "True-Blend" so remarkable for it's day was that it had a porcelain core, made of one of ten different shades that was matched to the patients original teeth or that best worked with their complexion. A layer of transparent enamel was set over the core, allowing the artificial teeth to have the closest comparison to natural teeth for it's day. Ideal Tooth Incorporated trademarked the name True-Blend in 1940 citing they had been using the name on products since 1936. Trade-Mark 377,867 was Registered May 14,1940 for True-Blend. Dr. Simon Myerson registered on Sept 27,1941 for a patent on an artificial tooth that describes the "True-Blend" tooth and Patent 2,300,305 was issued on Oct 27,1942 for same artificial tooth. The "True-Belend" set would have been used by a Dentist to best mach a patient for the correct coloring, when creating a set of "True-Blend" artificial teeth. I do not know an exact date on this set; however I believe it's from the 1940s. 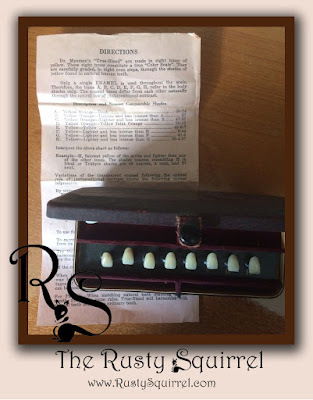 It's fascinating to find bit of Dental history that looks great and tells an interesting story and I believe this little box does just that. 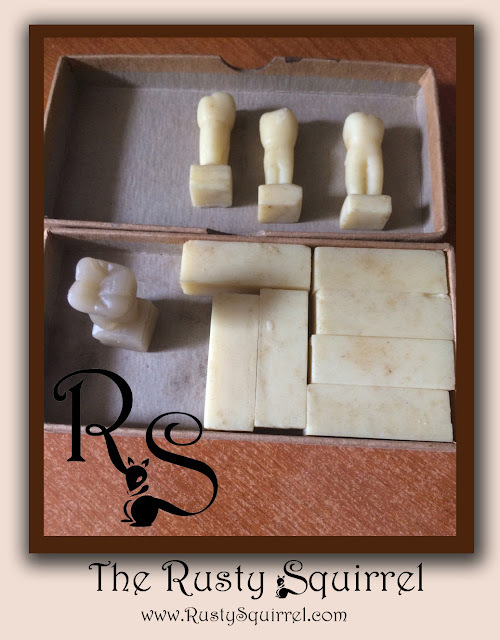 Another dental related item that's not as glamorous, is this vintage set of wax carving blocks and a few carved wax teeth. While doing my research on Dr Myerson, I read where he originally created each set of dentures for his patients by hand, so this little carving set seems a fitting side note and tie in to the above story. As odd as this little set must seem to most of us, dental students have been carving similar examples in their dental anatomy classes for years. Carving each and every tooth in detail helps aspiring dentists learn about the anatomy of each tooth. Some students take to this task easily and others find it frustrating but the carver of these teeth seemed to do a remarkably good job and I'm sure they passed this portion of their class with flying colors. This little box originally held 12 little wax blocks and now it houses 7 uncut blocks and 4 carved wax teeth. Three of the teeth seem to be of the same color and texture of the uncut blocks, the larger molar that is standing up is also of wax, but it's color is different so it was not carved from the same wax blocks in the set. I love vintage items of all kinds and if it's vintage and rusty that's even better. My hubby's nickname for me is Squirrel, since I constantly collect as many interesting things as I possibly can. So with my ever growing collection, that's tuck away here and there, I've now become The Rusty Squirrel. The Rusty Squirrel is where I will showcase a variety of vintage collectibles and curiosities; some I've had in my collection for many years and others which I've recently acquired. I enjoy displaying my treasures; but there are times a collection can get out of hand, and in order to bring in the new, you need to re-home the older items, which you're finally able to part with. 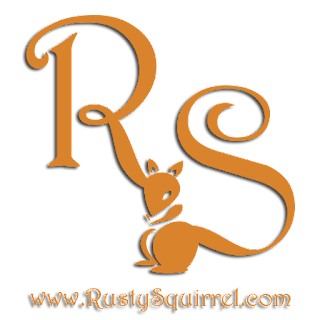 The Rusty Squirrel blog will spotlight a variety of vintage items: some new, some unknown curiosities I've yet to identify, and the majority, will be items that are leaving my collection in hopes of finding a new home. The above photo shows a selection of fun vintage finds in my collection. Victorian undergarments, a primitive spinning box, early 1900s magazines, antique photos and an assortment of vintage collectibles from the late 1800's to the mid 1900's. One of my favorites is the Mary Dunbar mixer from the 1930s. FYI- The white boots on the bottom right are more contemporary reproductions. I'm a big fan of Steampunk and find that antique shoes, boots and many clothing items just won't survive being worn and should be kept for display only. I own antique boots but not currently in white so I used my modern lace-ups in this antiques display. I like costuming and will blog from time to time showing fun clothing options for those who like cosplay. I'm all about corsets, hats, goggles and more! 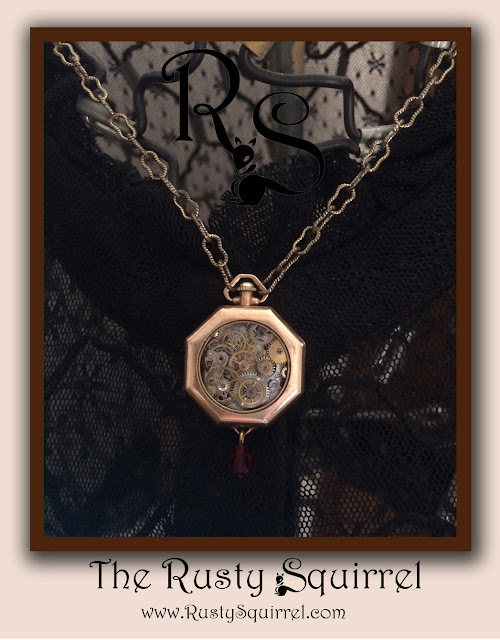 I even create steampunk inspired jewelry to wear. I like the challenge of taking something that's old but broken and turning it into an upcycled whimsy. A broken ladies pocket watch, some spare parts and a bit of patience = a unique wearable piece. I hope this blog will prove interesting and entertaining as well as informative and insightful; for you as well as myself. I never get board with learning about old things and even with diligent research there are times I come across "oddities" which end up in my "who knows" pile; so I thought it would be fun to include such and item in this first post. This is a recent addition to my collection and a mystery at the moment. This little gem measures 3" long by 7/8" wide and is smooth on one side yet on the other, half of it has a pattern to it. 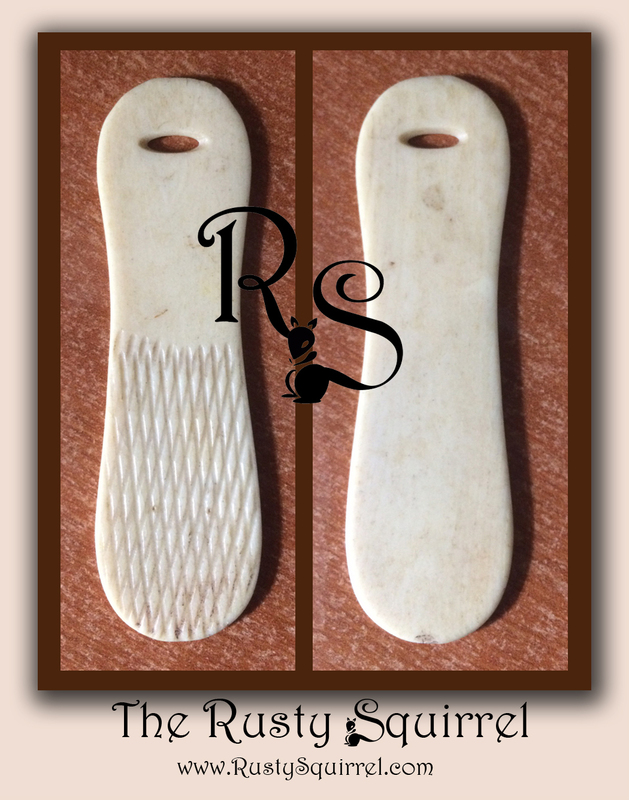 It is probably bone or ivory based on the smoothness and feel of the piece. I'm not striving so much to identify the material as I am it's purpose. It has the shape of an old-fashion ice cream wooden paddle you would get with those individual sized cups - remember those treats when you were a young kiddo - yummm. Well, I'm fairly certain that's not what this is. I thought it might be part of a manicure or dresser set; but the ridges in the piece are not sufficient for filing ones nails, and I've not seen an item of this shape in dresser sets before. The item was inside a vintage 1930's cigar box, which I purchased just so I could get this curious find; however, I don't think it's tobacco related. Most tobacco related tools have sharp points, are longer and narrower as well. Such a fun little mystery and should I find the answer I'll update the post to let you know as well. Thanks for joining me and I hope you liked the post.